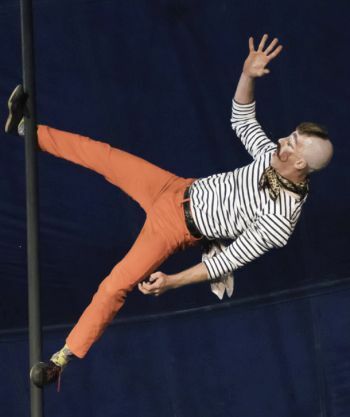 Chinese pole acrobat and Ringmaster Monsieur LouLou will make his debut appearance this year at the Moisture Festival. Can you imagine? Ross Travis is an award winning Actor/Creator, Bouffon, Physical Comedian and Circus Performer who has studied with world renowned master pedagogues including Dodi DiSanto, Giovanni Fusetti, Ronlin Foreman and Master Lu Yi. Ross’ lineage of training and experience allows him to create provocative performances that combine circus and bouffon to develop extreme characters and tell stories from the fringes, igniting dialogue and change that focus on ignored or taboo social issues.